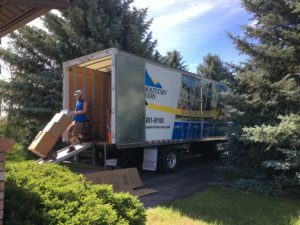 Rocky Mountain Movers knows that moving locally can be just as exciting and yet, as stressful as moving to another state. We service both residential and commercial moves. You will see our trucks in Salt Lake, Davis, Weber, Summit, Utah, and Tooele County just to name a few. Our goal is to help you fully understand how local moving is done. As Utah’s most recommended local movers, we want to help you know how moving charges are determined. Our rate is based upon the number of movers and the number of trucks required for the job and then that is charged at an hourly rate. Materials such as boxes, tape etc. are charged for based upon the quantity used. Call our office for your specific moving quote or get a free estimate now!